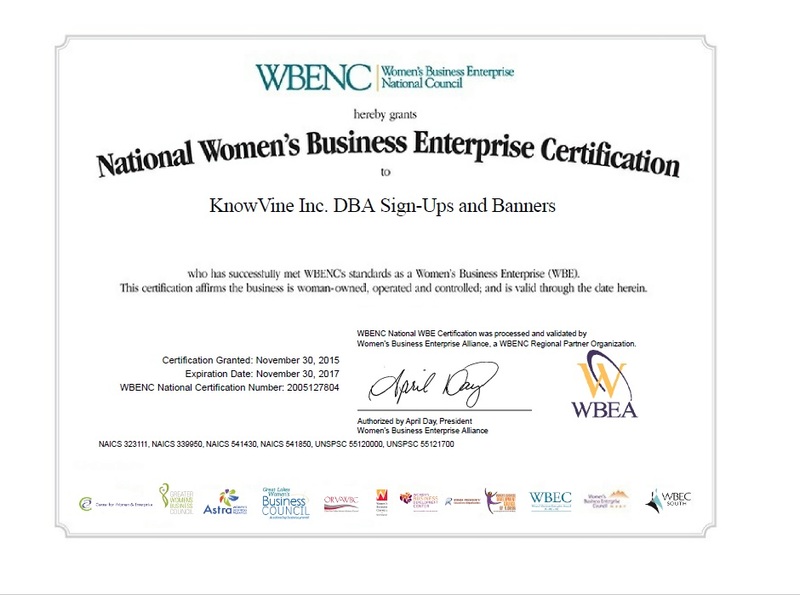 « We’re Certified by the WBEA for Signs, Vehicle Wraps & More! 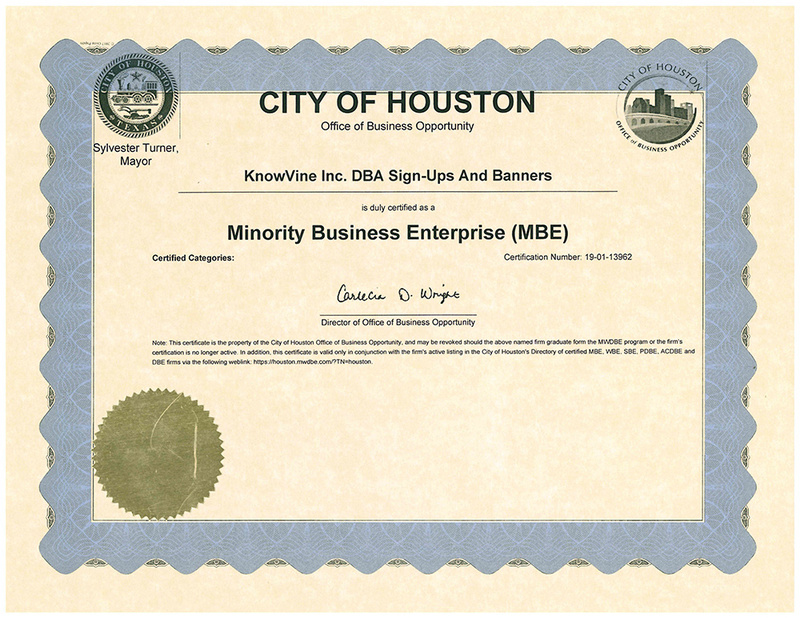 HOUSTON—Tuesday, January 14, 2014 — While many businesses are still gearing up for the New Year, Sign-Ups and Banners Corp. is steps ahead with strategic changes to grow its digital print and signage solutions. Already underway is the expansion of its storefront, bringing an additional 1,300 square feet for office space and more printing equipment. Sign-Ups is taking over the office space directly adjacent to its current location to gain the additional real estate. “We receive orders from all over the world and we want to fulfill those orders despite any time zone differences and urgent delivery needs. Expanding our equipment and office space will allow us to run multiple production machines simultaneously so we can remain committed to superior customer service and fast turnaround,” President Janet S. Featherston said. Sign-Ups also plans to hire additional staff to focus on sign sales to the commercial real estate arena, which is another growth opportunity for the company. 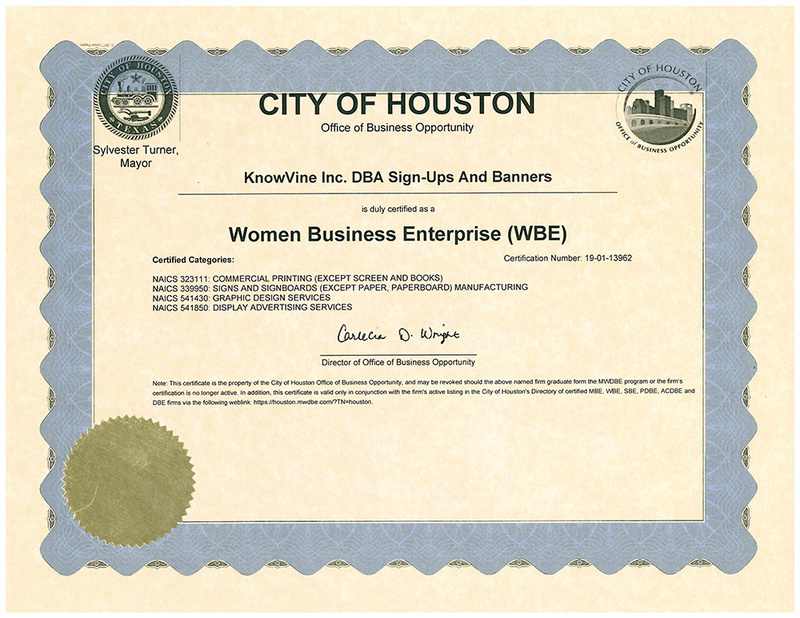 Featherston graduated from the Goldman Sachs 10,000 Small Businesses Initiative in late December 2013 and immediately began implementing changes at her Houston sign store. The growth plan developed in that program was reviewed by respected leaders in entrepreneurship and business growth. Tagged Business Growth, BVanners, Expansion, Goldman Sacs, Signs, Steps Toward Growth. Bookmark the permalink.